Judas Priest are an English heavy metal band formed in West Bromwich in 1969. The band has sold over 50 million copies of their albums to date. They are frequently ranked as one of the greatest metal bands of all time. Despite an innovative and pioneering body of work in the latter half of the 1970s, the band struggled with indifferent record production and lack of major commercial success or attention until 1980, when they adopted a more simplified sound on the album British Steel , which helped shoot them to rock superstar status. West Bromwich is a large market town and is one of the six amalgamated towns in the borough of Sandwell, West Midlands, England. Historically part of Staffordshire, it is 6.4 miles (10.3 km) northwest of Birmingham. West Bromwich has a population of almost 78,000 in 2018. 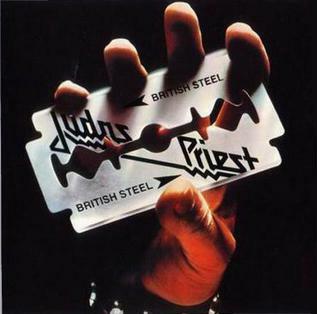 British Steel is the sixth studio album by the British heavy metal band Judas Priest, released on 14 April 1980. It is also the band's first album with Dave Holland on drums. The band's membership has seen much turnover, including a revolving cast of drummers in the 1970s, and the temporary departure of singer Rob Halford in the early 1990s. The current line-up consists of Halford, bassist Ian Hill, guitarists Glenn Tipton and Richie Faulkner, and drummer Scott Travis. The band's best-selling album is 1982's Screaming for Vengeance with their most commercially successful line-up, featuring Hill, Halford, Tipton, guitarist K. K. Downing, and drummer Dave Holland. Tipton and Hill are the only two members of the band to appear on every album. Robert John Arthur Halford is an English singer and songwriter. He is best known as the lead vocalist for the Grammy Award-winning heavy metal band Judas Priest. He is famous for his powerful wide-ranging voice and his now-trademark leather-and-studs image, both of which became revolutionary in heavy metal. In addition to his work with Judas Priest, he has been involved with several side projects, including Fight, Two, and Halford. Ian Frank Hill is an English musician, best known as the bassist of the heavy metal band Judas Priest. Glenn Raymond Tipton is an English Grammy Award-winning guitar player and songwriter. Often noted for his complex playing style and classically influenced solos, he is best known as one of the lead guitarists for heavy metal band Judas Priest. Halford's operatic vocal style and the twin guitar sound of Downing and Tipton have been a major influence on metal and have been adopted by many bands. Their image of leather, spikes, and other taboo articles of clothing were widely influential during the glam metal era of the 1980s. The Guardian referred to British Steel as the record that defines heavy metal. Despite a decline in exposure during the mid 1990s, the band has once again seen a resurgence, including worldwide tours, being inaugural inductees into the VH1 Rock Honors in 2006, receiving a Grammy Award for Best Metal Performance in 2010, and their songs featured in video games such as Guitar Hero and the Rock Band series. Glam metal is a subgenre of heavy metal, which features pop-influenced hooks and guitar riffs, and borrows from the fashion of 1970s glam rock. The VH1 Rock Honors were an annual ceremony paying homage to bands who influenced the sound of rock music. The events began in 2006, and the final event took place in 2008. The general format of each show is for modern bands to "pay tribute" to classic greats of the rock/metal world, after which time the artist being paid tribute to plays multiple songs. The 2006 and 2007 shows featured four inductees each, whereas the 2008 show featured one, albeit with multiple bands paying tribute. The shows were directed by David Mallet and produced by Paul Flattery. Currently, VH1 has no plans for a CD or DVD release of any show. Allan John Atkins is an English heavy metal vocalist, best known for his association with Judas Priest. Kenneth "K. K." Downing Jr. is a retired British guitarist and songwriter, co-founder of the heavy metal band Judas Priest, and an author. Walsall is a large industrialised market town in the West Midlands. Historically part of Staffordshire, it is located 8 miles (13 km) north-west of Birmingham, 6 miles (10 km) east of Wolverhampton and 9 miles (14 km) from Lichfield. Alan "Skip" Moore is a British musician, who is best known as the third official drummer of the heavy metal band Judas Priest, who played on their second album, Sad Wings of Destiny (1976). 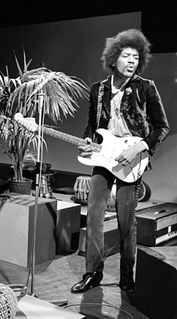 James Marshall "Jimi" Hendrix was an American rock guitarist, singer, and songwriter. Although his mainstream career spanned only four years, he is widely regarded as one of the most influential electric guitarists in the history of popular music, and one of the most celebrated musicians of the 20th century. The Rock and Roll Hall of Fame describes him as "arguably the greatest instrumentalist in the history of rock music". Moore left and was replaced with Christopher Louis "Congo" Campbell, and the band joined Black Sabbath guitarist Tony Iommi's management agency Iommi Management Agency. [lower-alpha 2] Atkins continued to write material for the band—including "Whiskey Woman", which became the base for the Judas Priest staple "Victim of Changes"—but as finances were tight and he had a family to support, he played his last gigs with the band in December 1972. Campbell left soon afterwards, and the band enlisted two members of the band Hiroshima: drummer John Hinch and vocalist Rob Halford, the brother of Hill's girlfriend. [lower-alpha 3] Judas Priest made their first tour of continental Europe in early 1974 and returned to England that April to sign a recording deal with the label Gull. Gull suggested adding a fifth member to fill in the band's sound; they took on as a second lead guitarist Glenn Tipton,  whose group The Flying Hat Band were also managed by Iommi's agency. A precursor of The Flying Hat Band called Shave'Em Dry featured future Starfighters drummer Barry Scrannage, who had played with original Priest members Ernest Chataway and Bruno Stapenhill in the band Bullion. 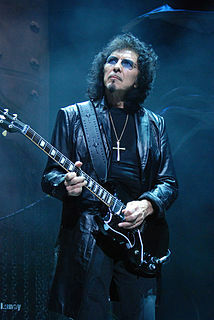 Anthony Frank Iommi is an English guitarist, songwriter and producer. He was lead guitarist and one of the four founder members of the heavy metal band Black Sabbath. He was the band's primary composer and sole continual member for nearly five decades. "Victim of Changes" is a song by British heavy metal band Judas Priest, featured on their 1976 studio album Sad Wings of Destiny. Adrien Begrand, writing for PopMatters, claimed the song changed the course of metal history. Vocalist Rob Halford's performance is considered one of his finest ever, the guitar work is noted as well, Bob Gendron praising the song's "landslide riffs" in the Chicago Tribune. The song has come to be regarded as one of the band's classics, and Martin Popoff listed it at No. 17 in his "Top 500 Heavy Metal Songs of All Time". Gull was a British record label founded in 1974. Owned by Gull Entertainments Ltd., it was associated with Morgan Sound Studio, and was distributed by both Pye Records and Decca Records. It was also distributed by Motown in the USA. Technical problems during the recording contributed to the poor sound quality of the record. Producer Rodger Bain, whose resume included Black Sabbath's first three albums as well as Budgie's first album, dominated the production of the album and made decisions with which the band did not agree. Bain also chose to leave fan favourites from the band's live set, such as "Tyrant", "Genocide" and "The Ripper", off the album and he cut the song "Caviar and Meths" from a 10-minute song down to a 2-minute instrumental. 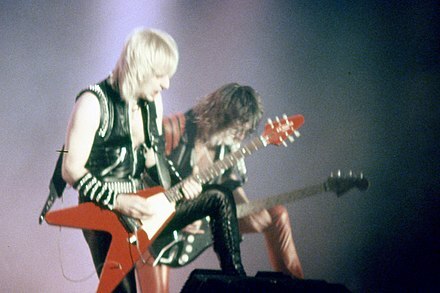 Judas Priest performing in 1981, during their World Wide Blitz Tour. Les Binks quit in late 1979, as he was unhappy with the band's desire to move towards a simplified radio rock sound, so they replaced him with Dave Holland, formerly of the band Trapeze. With this line-up, Judas Priest recorded six studio and one live album, which garnered different degrees of critical and financial success. In 1980, the band released British Steel . The songs were shorter and had more mainstream radio hooks, but retained the familiar heavy metal feel. Tracks such as "United", "Breaking the Law", and "Living After Midnight" were frequently played on the radio. The next release, 1981's Point of Entry , followed the same formula, and the tour in support of the album featured new songs such as "Solar Angels" and "Heading Out to the Highway". On Sunday, 29 May 1983, the band played on Heavy Metal Day of the US Festival, a music festival in San Bernardino, California sponsored by Steve Wozniak. The band was fourth in the line-up that also included Quiet Riot, Mötley Crüe, Ozzy Osbourne, Triumph, Scorpions, and Van Halen. On 13 July 1985, Judas Priest, along with Black Sabbath and other performers, played at Live Aid. The band played at JFK Stadium in Philadelphia. Their setlist was "Living After Midnight", "The Green Manalishi (With The Two-Pronged Crown)" and "(You've Got) Another Thing Comin'". Turbo was released in April 1986. The band adopted a more colourful stage look and gave their music a more mainstream feel by adding guitar synthesisers. The album also went Platinum and had a successful arena tour in support, with 100 concerts in North America, Europe and Japan in 1986. A live album recorded on the tour, titled Priest...Live! , was released the next year, offering live tracks from the era. The video documentary Heavy Metal Parking Lot was created by Jeff Krulik and John Heyn in 1986. It documents the heavy metal fans waiting on 31 May 1986 for a Judas Priest concert (with special guests Dokken) at the Capital Center (later renamed US Airways Arena) in Landover, Maryland. Rob Halford in 1988. 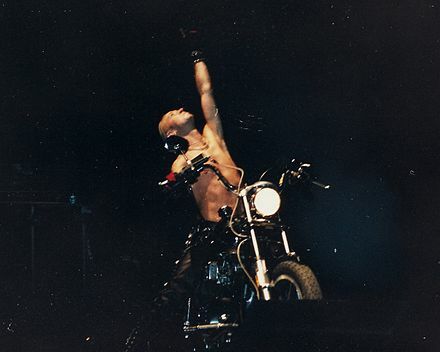 One of Priest's trademark stage stunts was to have Halford ride a motorbike on stage. In May 1988, Ram It Down was released, featuring several reworked songs left over from Turbo , in addition to new songs. The band recorded three tracks with pop producers Stock-Aitken-Waterman: two originals, "Runaround"  and "I Will Return",  and a cover of The Stylistics' hit "You Are Everything"; however, they were ultimately not included on this album due to a management decision. A reviewer has called Ram It Down a "stylistic evolution" that resulted from the band's "attempt to rid themselves of the tech synthesiser approach ... and return to the traditional metal of their fading glory days". The reviewer argued the album showed "how far behind they were lagging ... the thrashers they helped influence" in earlier years. In 1989, longtime drummer Dave Holland left the band. In September 1990, the Painkiller album used a new drummer, Scott Travis (formerly from Racer X), who gave the band an edgier sound thanks to his heavy use of double pedals and blast beats. This comeback album also dropped the 1980s-style synthesisers for all songs except "A Touch of Evil". The tour used bands such as Annihilator, Megadeth, Pantera, Sepultura and Testament as opening bands, and culminated in the Rock in Rio performance in Brazil in front of 100,000+ fans. The men's parents and their legal team alleged that a subliminal message of "do it" had been included in the Judas Priest song "Better by You, Better than Me" (a cover of the Spooky Tooth number) from Stained Class (1978). They alleged the command in the song triggered the suicide attempt. The trial lasted from 16 July to 24 August 1990, when the suit was dismissed after the judge ruled that the so-called "do it" message was a result of an accidental mixup of background lyrics. One of the defence witnesses, Dr. Timothy E. Moore, wrote an article for Skeptical Inquirer chronicling the trial. The trial was covered in the 1991 documentary Dream Deceivers: The Story Behind James Vance Vs. Judas Priest. Halford collaborated with Judas Priest in the release of a compilation album entitled Metal Works '73–'93 to commemorate their 20th anniversary. He also appeared in a video by the same title, documenting their history, in which his departure from the band was officially announced later that year. Tim "Ripper" Owens, who had previously sung in a Judas Priest tribute band called British Steel, was hired in 1996 as Judas Priest's new singer. This line-up released two albums, Jugulator (1997) and Demolition (2001), as well as two live double-albums – '98 Live Meltdown and Live in London (2003), the latter of which had a live DVD counterpart. Although Jugulator sold relatively well, it was given mixed reviews. After eleven years apart, faced with an ever-growing demand for a reunion, Judas Priest and Rob Halford announced they would reunite in July 2003, to coincide with the release of the Metalogy box set (despite Halford's earlier insistence that he "would never do it"  ). They did a concert tour in Europe in 2004, and co-headlined the 2004 Ozzfest, being named as the "premier act" by almost all US media coverage of the event. Judas Priest and "Ripper" Owens parted amicably, with Owens joining American heavy metal band Iced Earth. A new studio album, Angel of Retribution , was released on 1 March 2005 (US) on Sony Music/Epic Records to critical and commercial success, earning the band a 2005 Metal Hammer Golden Gods Award for Best Album. A global tour in support of the album ensued. As for the band Halford, writing for the fourth release was cut off. After the Retribution tour in June 2006, however, Halford announced he would create his own record company, Metal God Entertainment, where he would release all his solo material under his own control. In November 2006 he remastered his back catalogue and released it exclusively through Apple's iTunes Store. Two new songs allegedly set for the fourth release, "Forgotten Generation" and "Drop Out", were released through iTunes as well. Judas Priest in typical heavy metal attire performing at the VH1 Rock Honors in Las Vegas on 25 May 2006. Along with Queen, Kiss and Def Leppard, Judas Priest was an inaugural inductee into the "VH1 Rock Honors". The ceremony took place 25 May 2006 in Las Vegas, Nevada, and first aired on 31 May. Their presentation was preceded by Godsmack performing a medley of "Electric Eye"/"Victim of Changes"/"Hell Bent for Leather." Judas Priest then played "Breaking the Law", "The Green Manalishi (With the Two Prong Crown)" and "You've Got Another Thing Comin'", before which Halford rode a Harley onstage. In early February 2009, the band joined the ranks of bands speaking out against ticket-touting ("scalping"), issuing a statement condemning the practice of selling tickets at well above face value, and urging fans to buy tickets only from official sources. In the same month, Judas Priest continued their tour, bringing their "Priest Feast" (with guests Megadeth and Testament) to multiple arenas in England, Wales, Scotland, and Ireland in February and March 2009. From there the tour progressed to multiple venues in Sweden. Later in March, Judas Priest performed in Portugal (at Lisbon on the Atlantic Pavilion), which they had not visited since 2005. 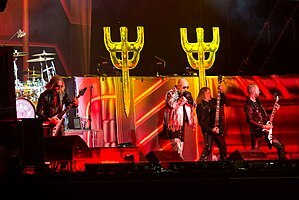 The tour then continued to Milan, Italy, and then Paris, France; Halford had last performed with Judas Priest in Paris in 1991. Judas Priest headlined the Sweden Rock Festival in June 2008. On 20 April 2011, it was announced that K. K. Downing had retired from the band and would not complete the Epitaph World Tour. Downing cited differences with the band and the management, and a breakdown in their relationship. Richie Faulkner, guitarist for Lauren Harris's band, was announced as his replacement for the Epitaph World Tour. Downing's retirement leaves bassist Ian Hill as the only remaining founder member of the band. In addition to the sound, Judas Priest is also known for being revolutionary in heavy metal fashion. In the band's early years, they dressed in hippie-style 1970s outfits, but as the decade drew to a close, the rise of punk rock made this look outdated, so the band began wearing simplified wardrobes on their 1978 tour. For the 1979 tour, Halford adopted his now-trademark leather-and-studs look, inspired by punk fashion and leather culture. The rest of the band adopted a similar style which became prominent at the time of their 1978 release, Killing Machine . This style would go on to be adopted by many heavy metal bands in the early 1980s, especially those of the NWOBHM and early Black Metal movements. To this day, it is not uncommon to find metal artists and fans sporting such a look at concerts. The drama-comedy film Rock Star (2001), starring Mark Wahlberg, is loosely based on the story of how Tim "Ripper" Owens replaced Rob Halford as the vocalist in Judas Priest. The Judas Priest song "Electric Eye" was used in the temp score for Toy Story 3 (2010),  but was ultimately replaced by another piece of music. One of the two main "gangs" in the remote Northern Territory community of Wadeye during the 2010s is called the "Judas Priests". Their main enemy is known as the "Evil Warriors". Defenders of the Faith is the ninth studio album by British heavy metal band Judas Priest. Three tracks were released as singles: "Freewheel Burning", "Some Heads Are Gonna Roll" and "Love Bites". The album was certified Platinum by the RIAA. Timothy S. "Ripper" Owens is an American heavy metal singer who currently performs with Spirits of Fire, the Three Tremors and A New Revenge. He first gained attention as the lead singer of Judas Priest, and then Iced Earth. He took the nickname "Ripper" from the Judas Priest song "The Ripper" during his time in the tribute band "British Steel". 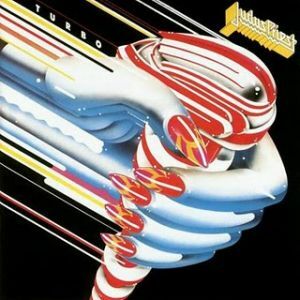 Turbo is the tenth studio album by British heavy metal band Judas Priest, released by Columbia on 14 April 1986. A remastered CD was released in 2001, including two bonus tracks. A 30th anniversary edition, released on 3 February 2017 titled Turbo 30, contains 3 CDs which features the album plus 2 CDs of a live recorded performance at Sandstone Amphitheater near Kansas City, Missouri on 22 May 1986. The album marked the band's first use of guitar synthesizers. Sad Wings of Destiny is the second studio album by the English heavy metal group Judas Priest, released in 1976. It is considered the album on which Judas Priest consolidated their sound and image, and songs from it such as "Victim of Changes" and "The Ripper" have since become live standards. It is the only album to feature drummer Alan Moore. Ram It Down is the eleventh studio album by Judas Priest, released in 1988 through Columbia Records; a remastered edition containing two bonus tracks was reissued in 2001. The album earned gold certification on 18 July 1988. The band toured in Europe and North America to support the release of the album. This is the last album to feature long-time drummer Dave Holland. Sin After Sin is the third studio album by English heavy metal band Judas Priest, released in 1977. It was remastered in 2001 with two bonus tracks added. Jugulator is the thirteenth studio album by British heavy metal band Judas Priest. It was released in Japan on 16 October 1997 and the rest of the world on 28 October 1997. It was their first studio album since Painkiller in 1990 and the first of two studio albums the band recorded without Rob Halford and with vocalist Tim "Ripper" Owens. "Breaking the Law" is a song by British heavy metal band Judas Priest, originally released on their 1980 album British Steel. The song is one of the band's better known singles, and is readily recognised by its opening guitar riff. Nostradamus is the sixteenth studio album by English heavy metal band Judas Priest, focusing on the 16th-century writer Nostradamus. It is a double album. The band's first concept album with Rob Halford, it was originally intended to be released in late 2006 before being pushed back to a 2007 release, and was finally released in June 2008 on Epic Records. It is the band's final album to feature K. K. Downing, before his retirement. "Painkiller" is the opening track on British heavy metal band Judas Priest's 1990 album, Painkiller, and was released as the first single off the album later that year. The Epitaph World Tour was a concert tour by English heavy metal band, Judas Priest, at the time intended to be the band's farewell tour. The tour commenced in June 2011 and concluded in May 2012. The tour was named after the 6th track from their Sad Wings of Destiny album. Redeemer of Souls is the seventeenth studio album by the English heavy metal band Judas Priest, which was released on 8 July 2014. It is their first album without founding guitarist K. K. Downing, who quit the band in 2011 and was replaced by new guitarist Richie Faulkner. It also marks the band’s last album to be produced by Glenn Tipton. The album sold around 32,000 copies in the United States in its first week of release to land at position No. 6 on the Billboard 200 chart, the band's second highest charting position in the US. This marks the band's first top 10 album debut in the US. It has sold 110,000 copies in the US as of February 2016. Firepower is the eighteenth studio album by British heavy metal band Judas Priest. It is the first studio album since 1988's Ram It Down to be produced by Tom Allom, and the first one with Andy Sneap as co-producer. The album sold around 49,000 copies in the United States within its first week of release, debuting at No. 5 on the Billboard 200 chart, making it the band's highest-charting album in the US. Music videos were made for "Lightning Strike", "Spectre" and "No Surrender". A lyric video was made for "Never the Heroes". 1 2 3 Popoff 2007, p. 2. ↑ Popoff 2007, pp. 2–3. 1 2 Popoff 2007, p. 3. ↑ Popoff 2007, p. 4. 1 2 Popoff 2007, p. 5. ↑ Popoff 2007, pp. 5–7. 1 2 Popoff 2007, p. 8. 1 2 Popoff 2007, p. 17. ↑ Popoff 2007, p. 16. ↑ "Judas Priest Info Pages – Rocka Rolla". Thexquorum.com. Retrieved 10 August 2014. ↑ "Judas Priest Info Pages – Forging The Metal". Thexquorum.com. Retrieved 18 April 2014. ↑ "Hotell Sentralt i Tønsberg – Quality Hotel Klubben". Nordicchoicehotels.no. Archived from the original on 15 July 2014. Retrieved 18 April 2014. ↑ "Newspaper cutting : Lydsjokk pa Klubben". Kkdowning.net. Retrieved 19 April 2014. ↑ "Judas Priest Behind The Music Remastered: Judas Priest". MTV. Retrieved 18 May 2014. ↑ "Judas Priest Tour Statistics". Setlist.fm. Retrieved 10 January 2015. ↑ "Judas Priest – Never Satisfied statistics". Setlist.fm. Retrieved 24 November 2015. ↑ Popoff 2007, p. 34. ↑ Popoff 2007, p. 32. 1 2 3 Popoff 2007, p. 39. ↑ Popoff 2007, pp. 39, 41. 1 2 Daniels 2007, p. 99. ↑ Daniels 2007, p. 96. 1 2 Popoff 2007, p. 27. 1 2 Daniels 2007, p. 100. ↑ Popoff 2007, p. 30. ↑ Popoff 2007, p. 33. ↑ Daniels 2007, p. 101. ↑ Popoff 2007, p. 29. ↑ Bowe 2009, p. 39. ↑ Cope 2013, p. 110. 1 2 Popoff 2007, pp. 41–42. ↑ Daniels 2007, p. 102. ↑ Popoff 2007, p. 122. ↑ Popoff 2007, p. 49. ↑ Popoff 2007, p. 44. ↑ Cope 2013, p. 114. ↑ Popoff 2007, p. 50. ↑ Daniels, Neil (2007). The story of Judas priest: Defenders of the faith. Omnibus Press. ISBN 978-0-85712-239-1. 1 2 Daniel Bukszpan (2003). "The Encyclopedia of Heavy Metal". ↑ "Unleashed in the East > Overview'". AllMusic . Retrieved 23 April 2007. ↑ "Defenders of the Faith Info Page". Judas Priest Info Pages. Archived from the original on 5 February 2007. ↑ "Songs - RUNAROUND - BY STOCK / AITKEN / WATERMAN -©1988 Mike Stock Publishing Ltd / Matt Aitken Music Publishing / All Boys Music Ltd- Mike Stock Music". Mikestockmusic.com. Archived from the original on 26 November 2015. Retrieved 22 January 2018. ↑ "Songs - I WILL RETURN - BY STOCK / AITKEN / WATERMAN -©1988 Mike Stock Publishing Ltd / Matt Aitken Music Publishing / All Boys Music Ltd- Mike Stock Music". Mikestockmusic.com. Archived from the original on 26 November 2015. Retrieved 22 January 2018. ↑ "Judas Priest – Ram It Down". Kickedintheface.com. Archived from the original on 6 December 2009. Retrieved 10 August 2014. ↑ "Q&A with Rob Halford > Overview'". The Gazette . Retrieved 22 August 2009. 1 2 3 4 Moore, Timothy (November–December 1996). "Scientific Consensus and Expert Testimony: Lessons from the Judas Priest Trial". Skeptical Inquirer . Retrieved 18 November 2006. ↑ Cooper, Candy (1 July 2005). "The Judas Priest Trial: 15 Years Later". Blabbermouth.net. Archived from the original on 1 October 2007. Retrieved 18 November 2006. ↑ "War of Words Info Page". Judas Priest Info Pages. Archived from the original on 5 February 2007. ↑ "Rob Halford Discusses Sexuality Publicly for the First Time". MTV News. 5 February 1998. Retrieved 24 May 2010. ↑ "Interview with Rob Halford of Two". NY Rock. Archived from the original on 7 September 2012. Retrieved 7 September 2012. ↑ "Metal Hammer Award Winners Announced". Metalunderground.com. Retrieved 22 January 2018. 1 2 "Work on New Album Is 'Going Incredibly Well'". Blabbermouth.net. 12 September 2006. Archived from the original on 1 October 2007. Retrieved 18 November 2006. ↑ Saulnier, Jason (16 April 2011). "Rob Halford Interview, Judas Priest Singer talks Rare Recordings". Music Legends. Retrieved 3 May 2013. ↑ "Judas Priest Issues Warning About Ticket Prices". idiomag. 12 February 2009. Retrieved 13 February 2009. ↑ "Message from Judas Priest after US Tour". Judaspriest.com. 24 August 2009. Retrieved 7 November 2010. ↑ "Whitesnake tour announcement". Judaspriest.com. 13 August 2009. Retrieved 7 November 2010. ↑ "Judas Priest Grammy Nomination for Dissident Aggressor". Judaspriest.com. 4 December 2009. Retrieved 7 November 2010. ↑ Reesman, Bryan (4 June 2010). "Rob Halford: Back To The Future". Attention Deficit Delirium. Retrieved 29 June 2010. ↑ "JUDAS PRIEST Announces Farewell 'Epitaph' Tour – Dec. 7, 2010". Blabbermouth.net. 7 December 2010. Retrieved 8 December 2010. ↑ "ROB HALFORD Doesn't Want Fans To Be Sad About JUDAS PRIEST's Upcoming Farewell Tour". Blabbermouth.net. 11 January 2011. Retrieved 13 January 2011. ↑ "JUDAS PRIEST Working on New Material – Jan. 27, 2011". Blabbermouth.net. 27 January 2011. Retrieved 28 January 2011. ↑ "JUDAS PRIEST: More Video Footage Of Los Angeles Press Conference – May 25, 2011". Roadrunnerrecords.com. Archived from the original on 20 August 2011. Retrieved 3 October 2011. ↑ "News – K.K. DOWNING retirement Press Release". JudasPriest.com. 20 April 2011. Retrieved 10 July 2011. 1 2 "JUDAS PRIEST Performs On 'American Idol' Finale; Video Available". Blabbermouth.net. 25 May 2011. Archived from the original on 29 May 2011. Retrieved 29 May 2011. ↑ "JUDAS PRIEST To Release 'Single Cuts' In August". Blabbermouth.net. 7 June 2011. Archived from the original on 11 June 2011. Retrieved 11 June 2011. ↑ "JUDAS PRIEST Singer Says '12 Or 14' Songs Have Been 'Completely Mapped Out' For Next Album". Blabbermouth.net. Archived from the original on 1 February 2013. Retrieved 5 September 2011. ↑ "Judas Priest Hints at New Music for 2013". Billboard. 6 August 2012. ↑ "Judas Priest Announce New Compilation Album – Lars Ulrich, Ozzy Osbourne, Alice Cooper and more chose their favorite Priest songs for 'The Chosen Few'". Rolling Stone. 13 September 2011. Retrieved 13 September 2011. 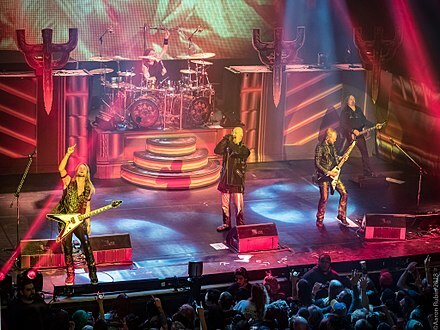 ↑ "JUDAS PRIEST's Rob Halford, Richie Faulkner Talk Epitaph, 40th Anniversary – "It's Not The End of Touring; We Are Still Going To Be Going Out There"". Bravewords.com. Retrieved 14 June 2013. ↑ "Official Judas Priest news: Christmas message". JudasPriest.com. 22 December 2013. ↑ "Rob Halford: New Judas Priest Album Is 'Finished' and 'F—ing Heavy'". Loudwire. 19 March 2014. Retrieved 19 March 2014. ↑ "Judas Priest Unveil New Track from Upcoming Album". Tapp Out Music. Retrieved 18 May 2014. ↑ Deriso, Nick. "ORIGINAL JUDAS PRIEST GUITARIST ERNIE CHATAWAY DIES OF CANCER". Townsquare Media . Retrieved 14 May 2014. ↑ "Judas Priest Lands First Ever Top 10 Album in U.S. With 'Redeemer of Souls'". Blabbermouth.net. 16 July 2014. Retrieved 10 August 2014. ↑ "JUDAS PRIEST TO ANNOUNCE TOUR DATES IN SUPPORT OF 'REDEEMER OF SOULS'". judaspriest.com. 20 May 2014. Retrieved 20 May 2014. ↑ "Judas Priest announces 2014 Tour Dates, Barclays Center, Izod Center, Atlantic City, FFF Fest & more included". Brooklynvegan.com. 27 June 2014. Retrieved 10 July 2014. ↑ "Judas Priest 2015 Redeemer of Souls Tour Schedule With Saxon". 11 January 2015. Archived from the original on 2 April 2015. Retrieved 29 March 2015. ↑ Erickson, Anne. "Spotlight on: Judas Priest's Richie Faulkner". Reverb.com . Retrieved 18 November 2015. ↑ Hartmann, Graham. "Judas Priest Are Back in the Studio". Loudwire . Retrieved 19 April 2016. ↑ Huber, Nic. "Rob Halford Says New JUDAS PRIEST Will Arrive Early 2017". Metal Injection . Retrieved 5 April 2016. ↑ Wardlaw, Matt. "Judas Priest's Rob Halford Is 'Hell Bent' for Rock 'n' Roll Fantasy Camp: Exclusive Interview". Ultimate Classic Rock . Retrieved 28 April 2016. ↑ "JUDAS PRIEST To Begin Recording New Album In January; Next Tour To Start In 2018". Blabbermouth.net . Retrieved 2 November 2016. ↑ "JUDAS PRIEST Taps Producers TOM ALLOM, ANDY SNEAP For New Album". Blabbermouth.net . Retrieved 13 March 2017. ↑ "See First Photo Of JUDAS PRIEST And Production Team For New Studio Album". Blabbermouth.net . Retrieved 20 March 2017. ↑ Childers, Chad. "Rob Halford: Judas Priest Reach 'Some of the Final Moments' of Recording New Album, Promise 'Very Exciting 2018 Period'". Loudwire . Retrieved 28 April 2017. ↑ Divita, Joe. "Judas Priest 'Just About Done' Tracking 18th Studio Album". Loudwire . Retrieved 5 June 2017. ↑ Aswad, Jem. "Rock and Roll Hall of Fame 2018 Nominees Include Radiohead, Judas Priest, Kate Bush". Variety . Retrieved 4 October 2017. ↑ "BON JOVI Beats Out JUDAS PRIEST To Win 2018 ROCK AND ROLL HALL OF FAME Fan Vote". Blabbermouth.net . Retrieved 6 December 2017. ↑ "JUDAS PRIEST To Release 'Firepower' Album; North American Tour Announced". Blabbermouth.net . Retrieved 23 October 2017. ↑ "SAXON And BLACK STAR RIDERS To Support JUDAS PRIEST On 'Firepower' North American Tour". Blabbermouth.net . Retrieved 23 October 2017. 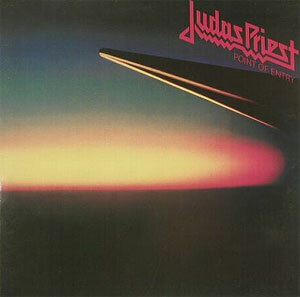 ↑ "JUDAS PRIEST: Listen To Audio Sample Of 'Firepower' Title Track". Blabbermouth.net . Retrieved 27 November 2017. ↑ Snapes, Laura (2018-02-12). "Judas Priest's Glenn Tipton diagnosed with Parkinson's disease" . Retrieved 2018-02-12. ↑ "JUDAS PRIEST's RICHIE FAULKNER: 'We'll See GLENN TIPTON On Stage Again'". Blabbermouth.net . Retrieved 1 March 2018. ↑ Lifton, Dave. "GLENN TIPTON JOINS JUDAS PRIEST ONSTAGE". Ultimate Classic Rock . Retrieved 20 March 2018. ↑ "GLENN TIPTON On His Future Role With JUDAS PRIEST: 'It's A Question That I Can't Really Answer'". Blabbermouth.net . Retrieved 22 March 2018. ↑ Jordan, Jerilyn. "Bassist Ian Hill on maintaining the firepower of Judas Priest". Detroit Metro Times . Retrieved 22 August 2018. ↑ "DEEP PURPLE And JUDAS PRIEST Announce North American Co-Headline Tour". Blabbermouth.net . Retrieved 23 April 2018. ↑ "OZZY OSBOURNE To Join Forces With JUDAS PRIEST For European Tour". Blabbermouth.net . Retrieved 3 September 2018. ↑ "JUDAS PRIEST Announces 2019 North American Tour With URIAH HEEP". Blabbermouth.net . Retrieved 10 March 2019. ↑ "ROB HALFORD: 'There's Definitely A New JUDAS PRIEST Album On The Way'". Blabbermouth.net . Retrieved 10 March 2019. 1 2 Andrew Laurence Cope. Black Sabbath and the Rise of Heavy Metal Music. Ashgate Publishing. ISBN 978-1-4094-9398-3. ↑ Roy Wilkinson (20 May 2010). "How Judas Priest invented heavy metal". The Guardian. Retrieved 10 August 2014. ↑ "Biography". AllMusic. Retrieved 13 February 2011. 1 2 Mastropolo, Frank (5 August 2014). "Four Decades of Hellfire with Judas Priest (Interview) – Rock Cellar Magazine". Rockcellarmagazine.com. Retrieved 22 January 2018. ↑ Wilkinson, Roy (20 May 2010). "How Judas Priest invented heavy metal". The Guardian . Retrieved 22 January 2018. ↑ "MTVNews.com: The Greatest Metal Bands Of All Time". MTV. 9 March 2006. Archived from the original on 5 September 2011. Retrieved 10 July 2011. ↑ Riddle, Tree. "Original Singer: Judas Priest Would've Sounded 'More Like AC/DC' If I'd Stayed in Band". Loudwire. Retrieved 27 March 2012. ↑ "Judas Priest Confirm UK Dates As Part of Epitaph World Tour". CaughtOffside. 28 February 2011. Retrieved 10 July 2011. ↑ Glasgowvant (22 February 1999). "Glasgow SECC | Judas Priest Epitaph Tour 2011". Glasgowvant. Retrieved 10 July 2011. ↑ Blabbermouth (13 December 2017). "BON JOVI To Join ROCK AND ROLL HALL OF FAME; JUDAS PRIEST Fails To Make The Cut". Blabbermouth. Retrieved 21 January 2018. ↑ "Hell Bent for Leather/Killing Machine Info Page". Judas Priest Info Pages. Archived from the original on 2 July 2007. ↑ "K.K. DOWNING: 'I Think JUDAS PRIEST Had A Bit Of An Identity Crisis From The Beginning'". Blabbermouth.net . Retrieved 16 July 2018. ↑ Wright, Jeb. "K.K. Downing – Wild Nights & Lots of Words!". classicrockrevisited.com. ↑ Reesman, Bryan (10 April 2010). "Judas Priest In 'Toy Story 3'? Almost". Attention Deficit Delirium. Retrieved 29 June 2010. ↑ Beaumont-Thomas, Ben (14 January 2014). "The Simpsons apologise to Judas Priest for calling them 'death metal'". The Guardian . Retrieved 27 January 2014. ↑ "JUDAS PRIEST's ROB HALFORD On ROCK AND ROLL HALL OF FAME: 'We Just Want To See Some More Metal In There'". 25 March 2018. ↑ "Video: JUDAS PRIEST Inducted Into 'Hall Of Heavy Metal History' At Germany's WACKEN OPEN AIR Festival". Blabbermouth.net . Retrieved 6 August 2018. ↑ "JUDAS PRIEST 'Knocked Out' By 'Metal Guru' Award At CLASSIC ROCK ROLL OF HONOUR". Blabbermouth.net. 8 October 2005. Retrieved 22 January 2018. ↑ "Kerrang Awards 2007: The Winners". Digitalspy.com. 24 August 2007. Retrieved 22 January 2018. ↑ "JUDAS PRIEST's ROB HALFORD: 'You Need Inspiration In Rock And Roll'". Blabbermouth.net. 12 June 2015. Retrieved 22 January 2018. ↑ "German Metal Hammer Awards - Metal Anarchy". metalanarchy.com. ↑ "BLACK SABBATH, SLIPKNOT, MOTÖRHEAD Honored At GOLDEN GODS AWARDS: Photos Available". Blabbermouth.net. 14 June 2005. Retrieved 22 January 2018. ↑ "'Metal Hammer Golden Gods' Winners RevealedMetal Insider". Metalinsider.net. 14 June 2011. Retrieved 22 January 2018. ↑ "Golden Gods 2018: Judas Priest, Code Orange, Maynard James Keenan amongst winners". ↑ "Metal Storm Awards 2005 - Metal Storm". Metalstorm.net. Retrieved 16 April 2018. Bowe, Brian J. (2009). Judas Priest: Metal Gods. Enslow Publishers. ISBN 978-0-7660-3029-9. Cope, Andrew L. (2013). Black Sabbath and the Rise of Heavy Metal Music. Ashgate Publishing. ISBN 978-1-4094-9398-3. Daniels, Neil (2007). The Story of Judas Priest: Defenders of the Faith. Omnibus Press. ISBN 978-0-85712-239-1. Huey, Steve. 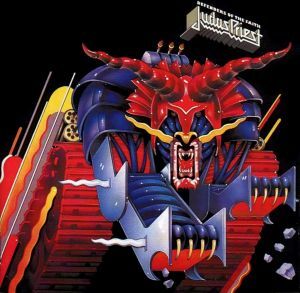 "Sad Wings of Destiny - Judas Priest | Songs, Reviews, Credits, Awards". AllMusic. Archived from the original on 26 November 2014. Retrieved 2014-05-18. Popoff, Martin (2007). Judas Priest: Heavy Metal Painkillers—An Illustrated History. ECW Press. ISBN 978-1-55022-784-0. Wang, K. S. (9 July 2008). "Celebrity Drive: Judas Priest Bassist Ian Hill mourns the demise of the British car industry". Truck Trend . Archived from the original on 2016-01-20. Retrieved 2018-01-15. "The Green Manalishi (With the Two Prong Crown)"